We all love a weird tech story, especially when it turns out to be true. That's exactly what has happened in the case of the Japanese RFID card that we saw last year, which is finally ready to begin its attempt to stop underage smoking. The taspo card was belatedly wheeled out at the weekend in Tokyo by the Tobacco Institute of Japan amid fanfare celebrating the imminent end of cigarette sales to minors. It's a basic identity card available only to those over 20, which is both the age of majority in Japan and the age at which one can buy tobacco products. All adults to carry card? 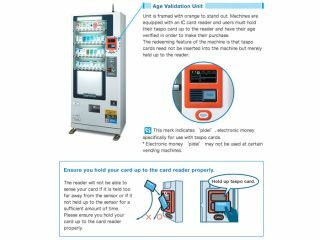 Taspo holders are supposed to verify their age by touching the card to readers attached to cigarette vending machines. Naturally, the industry is using the scheme to reassure the public that it really does care about more than naked profit. As we previously noted, the project is not without its flaws. Not only are there legitimate concerns about invasion of privacy - purchases could easily be tracked for marketing purposes - but the presence of cigarette-selling convenience stores on just about every Japanese street suggests taspo may have a hard time winning much acceptance.